When we eat beef, pork, lamb, chicken, or other foods from animals, our bodies take in proteins that may be rich in sulfur. That's unlike the proteins in plant foods—fruits, veggies, nuts, grains, or legumes like peas or dry beans. As we digest animal proteins, the sulfur in them forms acid. A slight, temporary acid overload—called acidosis—may result. borrow from our bones—the body's main storage depot for this essential mineral. Though calcium phosphate is an effective buffer and neutralizer, taking it from bones might increase our risk of osteoporosis. This unhealthy increase in the porosity of bones, and resultant thinning, leaves those afflicted with this disease especially vulnerable to fractures of the spine, hips, and wrists. Estimates from the National Institutes of Health (NIH) indicate that 10 million Americans, mainly women, already suffer from this disease. Another 28 million Americans are at risk. Other NIH analyses suggest that one in every two women and one in every eight men over age 50 in this country will have an osteoporosis-related fracture in their lifetime. Does Animal Protein Play a Role? The cause of osteoporosis is unknown. In exploring possible links between osteoporosis and what we eat, some researchers have developed a hypothesis and a model that point to sulfur-containing animal proteins as a culprit in the bone disease. The theory has commanded the attention of nutrition researchers, including scientists at the ARS Western Human Nutrition Research Center in Davis, California. They have teamed up with university colleagues to crack some of the secrets of osteoporosis. In a novel study, they recruited women who eat both animal and plant foods—the omnivore regimen typical of most Americans—and women who only eat plant-derived foods. What better way to monitor the possible effect of sulfur-containing proteins than by comparing the bone health of vegan volunteers, who don't eat animal proteins, with that of omnivore volunteers, who do? ARS physiologist Marta D. Van Loan of the Western Human Nutrition Research Center collaborated in the investigation with Anita M. Oberbauer of the University of California, Davis, and with Lydia-Anne Stawasz, formerly at the Davis campus and now at the University of California, Irvine. Forty-eight healthy, nonsmoking women, aged 18 to 40, volunteered for the 10-month study. At three intervals during the experiment, the women submitted records of the types and amounts of foods they had eaten during the previous 3 days. The records gave the researchers an indication of the amount of protein each volunteer had eaten. 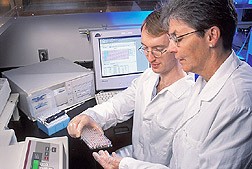 The volunteers gave blood and urine specimens at each lab visit. 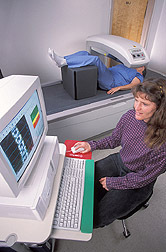 The samples were analyzed for any of several standard indicators of bone health. These included bone formation, as indicated by the amount of a chemical called osteocalcin; and bone resorption, or the amount of calcium removed from bone and reabsorbed into the bloodstream, as measured by another biochemical, N-teleopeptide. Other measures included renal net acid excretion and urinary calcium—both indicators of how much calcium was excreted from the body. The model that other scientists developed predicts that to maintain the correct balance of calcium in the blood, or homeostasis, renal net acid excretion and urinary calcium increase as intake of sulfur-containing animal proteins increase. But preliminary results suggest that osteoporosis may in fact be more complicated than the model predicts. The Davis scientists applied a statistical procedure—multivariate regression analysis—to determine the relative impact of each of the variables, or factors, they examined. As expected, they found that the vegan volunteers ate less protein than the omnivore volunteers. Also, as predicted by the model, renal net acid excretion and urinary calcium were higher in the volunteers who ate more protein (the omnivore women) than in those who ate less (the vegan participants). But two findings were unexpected. First, bone resorption—in which calcium is taken away from bones via the bloodstream—was the same for omnivore women as for vegan women. "The current model predicts increased bone resorption for people who consume large amounts of animal protein, so it was somewhat surprising that bone resorption was the same for both groups of our volunteers," Van Loan notes. Using the model as a basis, "one would not have predicted a significantly greater amount of bone formation for vegan volunteers than for omnivore volunteers," Van Loan adds. The implication for people who eat high amounts of animal protein may be important: Specifically, over time, the net effect of a lower amount of bone formation would likely be a decrease in bone density. Explains Van Loan, "If you have less bone formation, the result is the same as if you had an increase in bone resorption. So, even though bone resorption was the same in both groups of volunteers, the lower amount of bone formation in the omnivore women could lead to a decrease in their bone density." The findings, if borne out in larger studies, may lead to a modified model. What's more, the investigation may lead to other useful lines of inquiry for other studies.—By Marcia Wood, Agricultural Research Service Information Staff. Marta D. Van Loan is with the USDA-ARS Western Human Nutrition Research Center, One Shields Ave., Davis, CA 95616; phone (530) 752-4160, fax (530) 752-5271. "Boning Up on Osteoporosis" was published in the March 2003 issue of Agricultural Research magazine.